This ensemble of musical instruments is portrayed in this gorgeous arrangement. In this tapestry "Ensemble" we see an interplay between a variety of motifs from the violin and other musical instruments, with flowers and musical designs which in effect causes our eye to dance around these various themes bouncing from one to another. This reflects the ability of the beauty of a gorgeous visual ensemble such as the ensemble we see here. 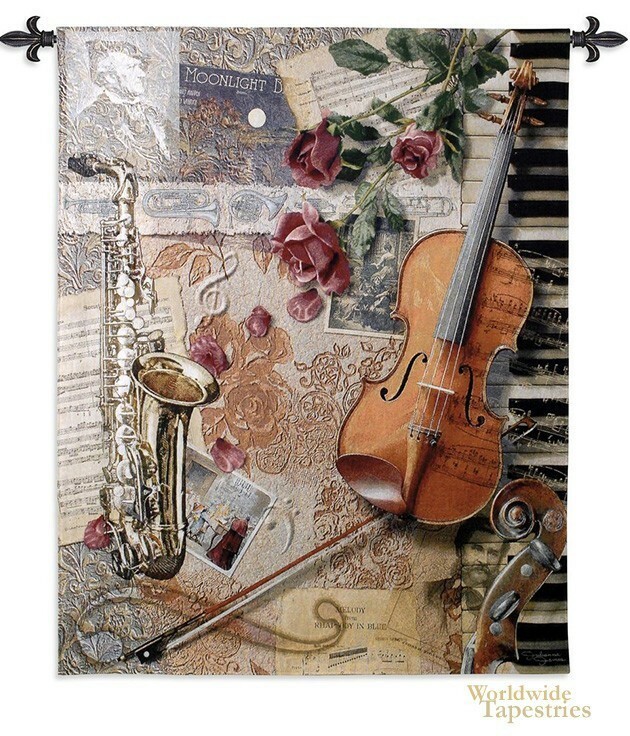 A gorgoeus piece for any home which loves music and the performing arts. This tapestry "Ensemble" is backed with lining and tunnel for easy hanging. Note: tapestry rods and tassels, where pictured, are not included in the price. Dimensions: W 41" x H 52"